Posted on 2, March 2016 by EuropaWire PR Editors | This entry was posted in Aviation & Aerospace, France, Marketing, Transportation & Logistics and tagged Airbus Group, Defexpo 2016. Bookmark the permalink. New Delhi, 02-Mar-2016 — /EuropaWire/ — Airbus Group will have a major presence at Defexpo 2016 taking place from 28-31 March 2016 in Goa, India. The highlight of the Group’s participation will be the ‘Make in India’ programmes that it is pursuing. These include the Indian Air Force’s Avro replacement programme where Airbus Group has bid to produce the C295W in India together with Tata Advanced Systems as well as its partnership with Mahindra Defence to produce military helicopters locally. Visitors to the Airbus Group stand (#3.2.10) in Hall 3 will find scale models of the C295W as well as the military helicopters H125M Fennec, AS565MBe Panther and the EC725 (now marketed as the H225M). In addition, there will be scale models of the SPEXER border/ coastal surveillance radar, a land based Electro Optical Targeting System (EOTS), ARGOS II and GOSHAWK II airborne observation systems, MUSS self-protection system against guided ammunition for battlefield vehicles and ALTAS-2QB hostile laser warners. 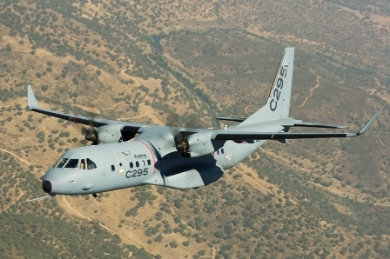 The selection process for the C295W medium transport aircraft is ongoing. This highly versatile aircraft is proven around the world as a tough, reliable and high-performance workhorse with outstanding lifecycle costs and excellent performance on short or unpaved runways. To date, 144 C295s have been delivered out of 165 on order and it is in service in 20 countries. The AS565 MBe Panther perfectly answers the requirements of the Indian Navy’s Naval Utility Helicopter (NUH) programme for around 100 units. It is an all-weather, multi-role light helicopter that can be operated from ship decks or offshore to cover a vast array of naval missions – such as maritime surveillance, search and rescue, casualty evacuation, vertical replenishment, offshore patrolling, counter-terrorism. The H125M Fennec is foreseen for the Indian Army’s and Air Force’s Reconnaissance and Surveillance Helicopter (RSH) need of around 400 units. The EC725 (now marketed as H225M) is under selection process for the Indian Coast Guard’s 14 shore-based helicopter tender and is also perfectly suited for the Indian Navy’s 120+ Naval Multi-Role Helicopter (NMRH) programme.